You must make reservations at least 5 minutes in advance of the time at Cured Tap & Table. Thanks for your interest in Cured / 18th & 21st to host your private event. We have spaces available for as few as ten and as many as 350 for your next event. Whether it's an intimate dinner with friends or a business holiday party we have space to suit your needs. We are excited to hear from you and help you plan the perfect event! Please contact patti@weckerhospitality.com to inquire about private events. The Cured / 18th & 21st Team. 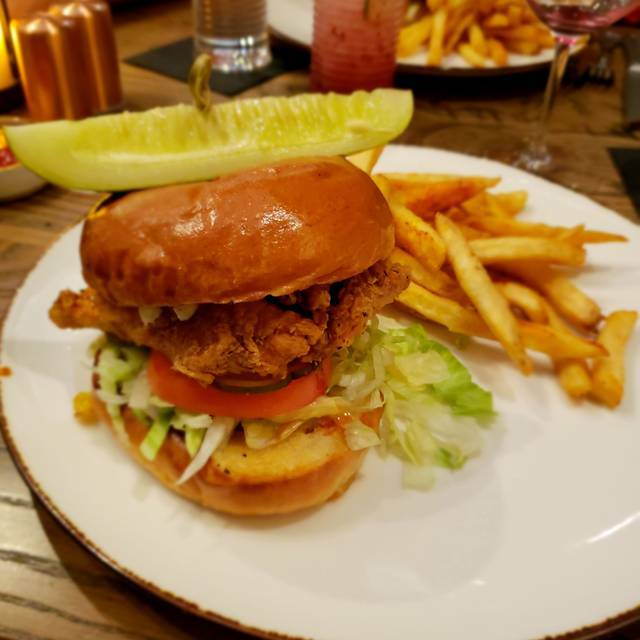 CURED Table & Tap is an exciting new restaurant in Columbia, Maryland that brings back fond memories of the neighborhood corner bar and the relaxing atmosphere that is created when good friends, great drinks, and classic comfort foods come together. From the list of exceptional craft beers, to the creative cocktails, to the satisfying menu, CURED is all about crafting a laid back experience while still elevating the pairing of comfort food and thirst quenching drinks. Our goal is for every guest who visits us to feel as relaxed as if they were at their grandmother’s house (assuming their grandmother makes amazing craft cocktails and delicious food). So if you're looking for a great place to meet up with friends, heading to a concert at Merriweather Post Pavilion right next door, or looking for something uniquely different but still wonderfully familiar, we'll make sure to save you a seat. Salmon BLT was fantastic. Best business casual dining option in Columbia! Staff and service were great! Side order of bacon was minimal and not very thick cut and the flat bread was a little boring but everything else was delicious. The french toast sticks/short rib/poached egg were definite hits! We'll definitely go back! Thank you for the wonderful words. It's great to hear that your experience with us was amazing. We are glad that our team took excellent care of you and you enjoyed your meals. We appreciate the great feedback. We hope to see you again soon! I brought a group of friends from work after talking about Cured for a month. Everyone loved it! The mussles we're excellent as was the tots with pulled pork and flat bread. We all also ordered dinner and the burgers were top of the list as was the meatloaf. There were choices for our meat lovers and our vegetarians. Lots of choices and high quality. Service was also excellent even with our large group. Not only will we be back, but several from the group have already been back or made a new reservation. Thank you for the lovely feedback. We are so excited to hear that your experience with us was great. We are delighted that your meals were excellent and you loved our burgers. We're happy that our team provided you with outstanding service. We appreciate the kind words. We hope to see you again soon! Thanks for the lovely feedback. We're flattered to see that your meals were amazing and you had an excellent time with us at Cured. 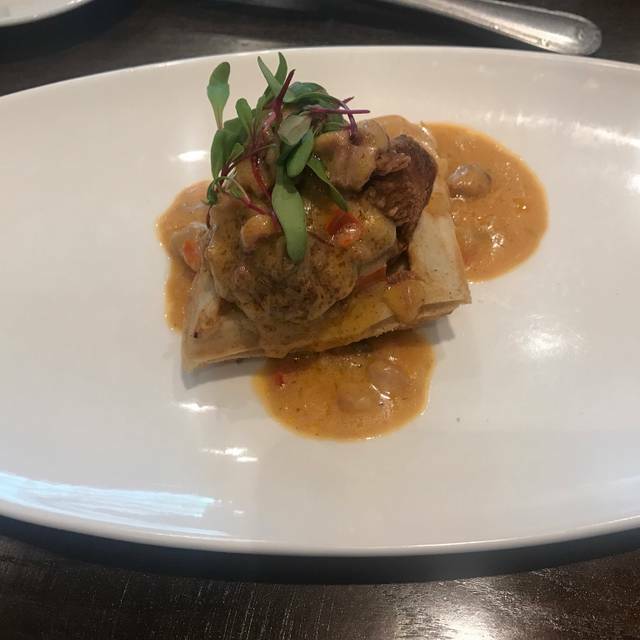 We are so excited to see that you loved our shrimp and grits, duck confit cinnamon roll, and all of your entrees were delicious. We appreciate the kind words. We hope to see you again soon! Thank you Cured, for making a great date night fantastically special. Upon arrival we were offered the private MedStar room which was not in use. It was perfect, allowing the 4of us privacy and the ability to hear much better than in the main dining room! The food was great and in the room we did not feel like Rebecca, our very attentive server, had forgotten us. She was great and had fun with us during the evening. Great food, but it was a little disappointing that so many of our cheese selections were out at 8pm on a busy Saturday. We had a great evening, enjoying the food, drinks and atmosphere. Will definitely return. Looking forward to experiencing 18th & 21st! Thank you for the great review. We are thrilled to hear that you had an amazing dining experience with us at Cured. We are glad that your meals were delicious and to you liking. We are overjoyed to hear that our team provided you with outstanding service and Rebecca was so wonderful and made your experience even better. We're delighted to hear all of this and appreciate it so much. We hope to see you again soon! The location, venue, and food were great. The server was exceptional. i will be visiting again soon. Thank you for the great review. We are thrilled to hear that you had a great time with us. We're glad your meals were amazing and our team provided you with outstanding service. We hope to see you again soon! Very good food. Waitress didn’t seem knowledgeable about menus. Very stand off. Another waitress came over to give recommendations. We keep forgetting about Cured and every time we go back we fall in love with it again. Our server, Angela was awesome and catered to our special needs and tastes. Cured is in its own league and you would need to go downtown DC to find anything even close. Gregory, Thank you for the marvelous feedback. We are excited to hear that you love your dining experiences with us so much. We are thrilled that your meals are always wonderful and everything is always to your liking. We appreciate the lovely feedback. We hope to see you again soon! This time around we had a great experience. The staff and food were great. The private room was amazing! We will be back! Thank you for the blissful feedback. We're excited to hear that your visit with us was amazing. We are charmed to hear our team took wonderful care of you and your meals were delicious. We appreciate the lovely feedback. We hope to see you again soon! Absolutely love Cured! Great place to bring friends for a great dinner and fabulous drinks! Highly recommend. And our waiter, Matty was especially awesome as well! Jessi, We appreciate the fabulous feedback. It is so wonderful to hear that your visit with us was absolutely wonderful. We are thrilled that you loved your meals and your drinks were great. We're glad to hear Matty was great and took fantastic care of you. We hope to see you again soon! This is the second time we've eaten here. The service leaves a lot to be desired. The wait staff seem overburdened and too busy to check on their patrons. No one asked if we needed anything or if we were enjoying our meals. The food is not bad but the poor service over shadows the experience. Food and atmosphere are fantastic. Thank you for the nice feedback. We are glad to hear that your meals were excellent and you enjoy our atmosphere so much. Thank you for the kind words. We hope to see you again soon! Our reservation was at Cured for lunch but we were also planning a dinner outing and asked the receptionist if we could get a peak at 18th and 21st. She happily complied. We also met the woman who manages 18th and 21st and she went above an beyond explaining when we should make reservations is we were coming on a Wednesday night versus other nights of the week. She even stopped by at our table while we were eating lunch to chat some more. Our server was very attentive. We were discussing business so lunch ran pretty long, but she continued to refill our beverages and didn't bother us about how long we were there. Everyone was wonderful. April, Thank you for the kind words. We are flattered to hear that you had a great time with us. We are overjoyed to hear our team provided you with outstanding service and went above and beyond to make your visit great. We are delighted that you enjoyed your meals and everything was so wonderful. We truly appreciate the wonderful review. We hope to see you again soon! We enjoyed our dinner at Cured. We made a mash up of appetizers including the oysters (best we've had in a while) tuna tartar, sweet potato fries and an assortment of meat and cheeses. All high quality, nicely arrayed and served graciously by the wait staff. Shelley, We appreciate the blissful feedback. We are happy to hear that you had a nice visit with us. We're thrilled that you found our oysters, tuna tartar, sweet potato fires, and everything so wonderful. We are so excited to hear that our team provided you with outstanding service. We hope to see you again soon! Great tie, good food and very comfortable!! wonderful experience. Thanks, Ben. We're happy to see that you had a nice experience with us. We are glad that your meals were delicious and our team took fabulous care of you. We hope to see you again soon! Thanks, Kathy. We're so happy to see you had a wonderful time with us. We are happy that your meals were amazing and our team took excellent care of you. We hope to see you again soon! Creative cuisine at reasonable prices! Excellent service. Thank you for the fabulous feedback. We're delighted to see that your visit with us was marvelous. We're charmed that your meals were delicious and our team took wonderful care of you. We hope to see you again soon! We really enjoyed our first meal at Cured. Menu has something for everyone. Service was outstanding. Good wine list. The general decor is striking and very attractive. Tables not too close together, so you can talk to your table companion. We will be back often! Thank you for the nice feedback. We are delighted to hear that you had a great first time with us at Cured. We are glad that your meals were wonderful and you enjoyed our selection of wines. We are happy to see that our team took fabulous care of you and everything was great. We hope to see you again soon! We had a lovely evening. I made a mistake on my reservation and everyone was so kind and accommodating. We had the crab cake and the cod special. Our dinners were delightfully plated and were very tasty! We definitely will be back! Thank you for the kind words. We are excited to see that your visit with us was so wonderful. We're glad that your meals were delicious and you found our crab cake and cod special to your liking. We appreciate the nice feedback. We hope to see you again soon! Lobster appetizer too smoky. Venison very gristly. Chicken very good. Service great. Very cheerful and friendly. Very noisy. My son and I love Cured. We took our extended family here and the visit was not quite as good as previous trips. The food was a little lower quality and our waitress was not as good as some of the other servers we've had. We plan to return and hope for a better experience next time. Thank you for the great feedback. We are happy to see that you enjoyed your experience. We are glad your meals were enjoyable. We appreciate you taking the time to share your feedback. We hope to see you again soon! Loved the idea of a "tapas" style brunch! Now, one no longer has to choose between eggs and pancakes---you can have both! Everything was well prepared and beautifully presented. We had the French toast sticks with 5-spice infused maple syrup (I'll never be able to eat plain maple syrup again), the Breakfast Flatbread, Short Rib Hash, and Chicken with Waffle. All were delicious. Four items in total were perfect for my husband and me. Most importantly, the coffee was plentiful and HOT (I hate when coffee is served anything less than slightly below boiling temperature!). We will be back for brunch at Cured. Thank you for the blissful feedback. We're charmed to hear that you had such a fabulous experience with us. We are thrilled that your meals were excellent and you enjoyed our French toast sticks and infused maple syrup so much. We appreciate the kind words. Thank you again for sharing your experience. We hope to see you again soon! Cured was so wonderful! Awesome drinks -- fun cocktails, lots of good beer, and wine -- and a wide selection of good food. The staff was so friendly and warm, and so accommodating. Such a great new spot in Columbia!! I only gave 4 stars because it was a busy night -- a little loud and service could have just been a touch faster. But overall an amazing experience. Thank you for the nice feedback. We are excited to see that you had a good time with us. We're delighted to hear your meals were outstanding and you found our cocktails delicious. We appreciate the nice feedback. We hope to see you again soon! Great service and food. plenty of drink options us happy hour specials. Thank you for the fabulous feedback. We're excited to see our team took wonderful care of you and your meals were great. We are happy that you enjoyed our Happy Hour specials. We hope to see you again soon! The food is very tasty! The mushroom soup is just the best available anywhere. 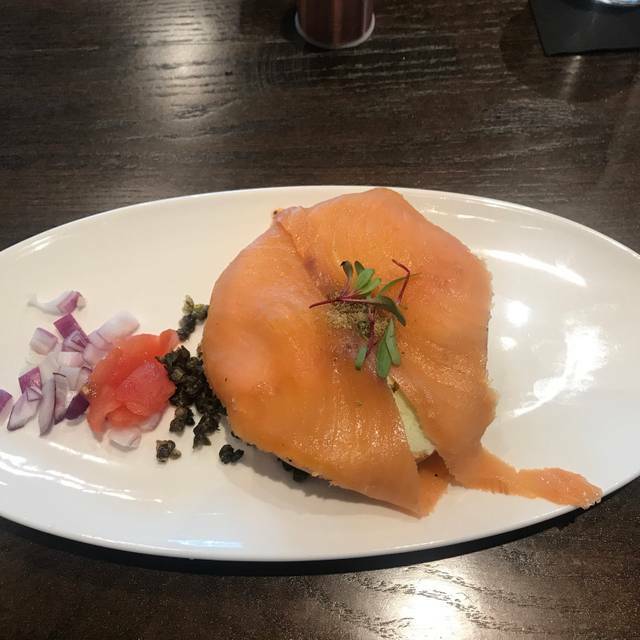 The Salmon was prepared to perfection. The espresso cheese cake was light and so delicious. Best of all was the attentive service by Casey. Tom, Thank you for the blissful feedback. We're excited to hear you had a lovely time with us. We are thrilled that your meals were excellent and our mushroom soup and salmon were great. We're excited to hear our team took fabulous care of you and Casey was so attentive and nice. We hope to see you again soon! So far we have visited twice, with friends. Both times the service was terrific (but it was the same waiter each time.) The ambiance in Cured is great, and we visited the (closed at the time) 18th and 21st and were very impressed with the decor and look forward to having dinner there. The food at Cured was very good. First visit I had a burger and wish it had been hand-formed instead of formed in a mold. The second time I had the crab cake. It was pretty good but has a lot of competition around here so it wasn't great by comparison. Presentation was very nice. Janet, We appreciate the nice words. We are glad to hear that both of your experiences with us were wonderful. We are thrilled that you enjoyed your meals so much and found our burger excellent and our crab cakes to your liking. We appreciate the wonderful feedback. We hope to see you again soon! What a great surprise! The preparation, execution, and presentation of each dish were delightful. The flavors were spot-on and the meal was a great dance of courteous, prompt and friendly service! And they were even pleased to honor a special request for our finicky 7yr old son. We can't wait to go back again soon and experience more! Thank you for the lovely feedback. We are charmed to see that you had a marvelous experience with us. We're thrilled that your meals were delicious and our team provided you with outstanding service. We appreciate the nice words. We hope to see you again soon! Thank you for the nice words. We are happy to see you loved your dining experience with us so much. We are thrilled that you found our crab cake sandwich and mac and cheese so much. We are glad that our team took fabulous care of you and Sean was wonderful. We appreciate the feedback. We hope to see you again soon! Food was good. Had to send a meal back as it was cold. The server was great, but it took a really long time to get our cocktails & dinner. I would try again. Carol, Thank you for the fabulous feedback. We're charmed to hear that you loved your meals and our team took great care of you. We hope to see you again soon! Highly recommend this new restaurant in Columbia. Our waiter was wonderful and all the food he recommended was delicious! It was our first time to this restaurant and we will definitely be coming back. We appreciate the wonderful words. We're charmed to see that you enjoyed your dining experience with us so much. We are happy that our team provided you with excellent service and your meals were so delectable. We hope to see you again soon! I have been here 4 times. Unfortunately this time we were seated in the bar area in front of the doorway to the more enclosed seating area. (I asked if we could be seated in the more comfortable dining area and was told no space was available for a party of 6. There were several adjoining tables for 4 empty) It was very noisy and the traffic around our table was significant. My friend who was at the end seat of our table was knocked into several times. The metal chairs in the bar where they sat us were extremely uncomfortable. Lovely environment. Great wait staff. Crab cake was delicious. German chocolate cake, not so good. Thank you for the kind words. We're charmed to see that you enjoyed your meals so much and our crab cakes and German chocolate cake wonderful. We are glad our team took good care of you. We hope to see you again soon! Great service. A friendly causal place to meet friends and enjoy a meal and conversation. Many interesting and tasty options for Brunch. We appreciate the wonderful words. We're happy to hear that your experience with us was a great one. We are thrilled to hear our team took great care of you and your meals were flavorful. We hope to see you again soon! Kate, Thank you for the cheerful feedback. We're happy to see you enjoyed your brunch. We appreciate the kind words. We hope to see you again soon! Jimmy, We appreciate the lovely feedback. We are glad to hear that you had a wonderful first experience with us. We are overjoyed to hear that our team provided you with phenomenal service and your meals were amazing. We hope to see you again soon! I went on a Friday night for dinner. There was a nice crowd, but I would recommend reservations. Service was amazing. Servers knew the menu well and made great suggestions. The food was delicious. Drinks were perfect. I would definitely go back and try happy hour. Thank you for the lovely feedback. We're glad to see you enjoyed your experience with us. We are thrilled that our team provided you with stellar service and were so kind and helpful. We appreciate the great feedback. We hope to see you again soon! Great experience and good , enjoyed everything about this place! Lindsay, We appreciate the fantastic feedback. We're glad that you enjoyed your time with us. We are happy your meals were delicious and our team took great care of you. We hope to see you again soon! A new Columbia favorite! Food and service is outstanding and the perfect lunch and dinner place. Thank you for the cheerful feedback. We are glad to hear that your visit with us was great. We are thrilled your meals were amazing and our team took fabulous care of you. We hope to see you again soon! The duck pastrami and the beef marrow bones are fantastic. Thank you for your kind words. 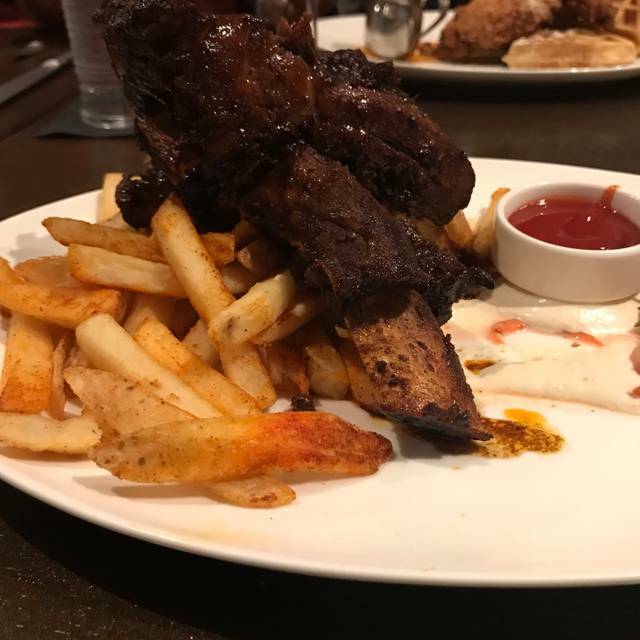 We are happy to see that you found our duck pastrami and the beef marrow bones were great. We appreciate the lovely feedback. We hope to see you again soon!